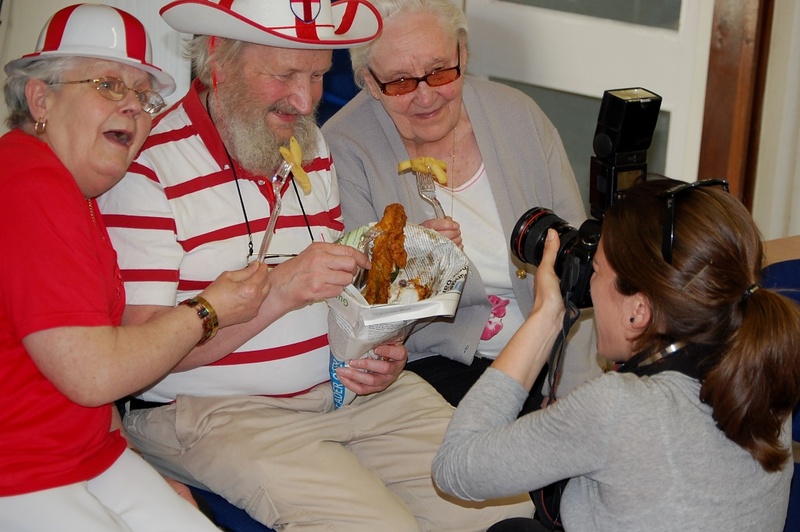 We held a pensioners' party to mark St George's Day this afternoon. A traditional East End band played old favorites (think Chas & Dave!!!) and about 50 guests enjoyed a little dance and sing-a-long followed by a fish n' chip dinner. The photographer from the paper clearly had a preset idea of what to take... She turned up, sat these three together, took a few snaps and was off to her next assignment... Staged, but it's a nice story and good publicity for work. ha, love this! and you can't beat a nice bit of chas & dave! What a great "picture within a picture"! The colors, the faces and the photographer in the ppicture add up to a great shot of your own! this is fab! love those red and white outfits!